a solemn occasion when we commemorate the anniversary of the first major military action fought by the Australian and New Zealand forces during the First World War, and pay tribute to the men and women of our armed forces, both past and present. 25 April is also an important day in Venice: it’s both the anniversary of the liberation from the Nazi-Fascists forces in 1945 during the Second World War, and it is the Feast day of the city’s patron saint, Mark the Evangelist, or ‘Festa del Bocolo. Traditionally, men give their special girl a ‘bocolo’ – a single red rose in bloom on this day. 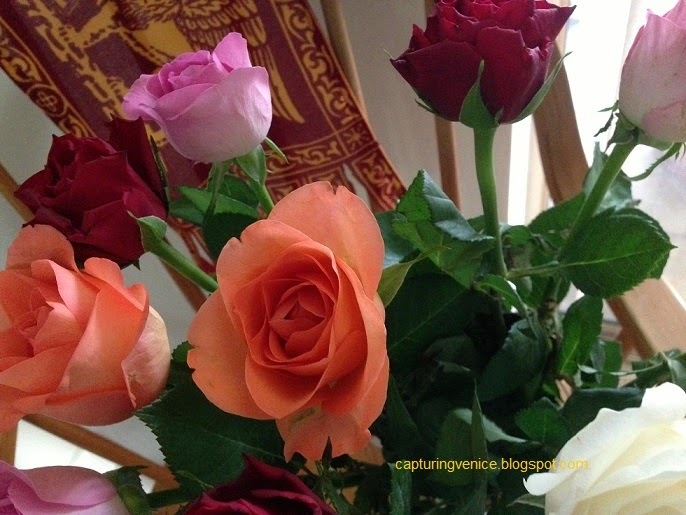 I spied a bouquet of mixed roses at the shops this morning, and couldn’t help bringing them home for my husband. As you can see in the background, the winged lion of Saint Mark has a prominent in our household. Auguri per un buon 25 Aprile e buon festa del Bocolo!